I don't usually do link posts but a couple of stationary related Kickstarters have come to my attention. A carbon fiber fountain pen designed by the french! They are using both Bock and Jowo nibs depending on which model you back. It is an interesting design where they have the pen in sections which you can disassemble by pulling. I personally do not care about the stylus portion of the pen but I am glad that the stylus isn’t shaped like the regular round button. They also have option of a carbon fiber pen case that looks really sweet. It’s too bad that the pen case can only hold one pen. Now this is a Kickstarter after my own heart. A notebook designed for lefties! I’m not sure how the paper performs under fountain pens but the slanted lines might just solve my lefty problems. Check out these Kickstarter projects, if I’ve piqued your interest. Disclaimer: I wasn’t compensated in any form for writing this post. One of my major concern for the Simple Wallet was how easy it was to insert and retrieve folded cash from the wallet. After using both for a week, I can say that it wasn't easy on the Simple Wallet but on the Band it it was so much easier. The Band it seemed to be divided into 2 sections thanks to the way it was stiched. What I did was to put 3 cards on each "side" and slot my folded cash right into the middle. Easy in, easy out. Even with just one card in the Band it, the card remained in the wallet even after I shake the wallet. In the battle of the minimalistic wallet, I declare the Band it the winner as my wallet of choice. Simple Wallet didn't get my vote because I had preferred the stiff leather of the Band it that allows it to hold its shape regardless of the number of cards I have in it. I have backed [The Roost Stand][RSK] on [Kickstarter][K] many moons ago. It has finally arrived a month or so ago. I backed the all black Roost with "Original Kickstarter Backer" engraved. It costs me USD$65 + USD$20 for shipping that makes it roughly slightly over SGD$105 for me. The Roost is a laptop stand. There are many option out there available in Singapore such as Twelve South's HiRise or the cheap laptop stands sold on Qoo10. I choose to back the Roost because it is the most portable option that I have seen. There is limited real estate on my table and in my room so I like that the Roost is foldable and really really portable. The build of the Roost is really light but strong. It is made of carbon fiber and Delrin. Deploying the Roost is really easy but I had a little trouble getting the screen catches to fit into the gap between the keyboard and screen. Initially I had wondered if I am having trouble because my 15" MacBook Pro Retina has a Speck case on it. Turns out that I was just not able to align the catches properly. The Roost is very stable even with my MacBook Pro on it. I can easily move the entire stand with my laptop on it without trouble or worries. I am really happy with the Roost. It has since corrected my sitting posture and I have suffered from no neck and shoulder pain since. I highly recommend the Roost who needs to use a laptop as a main computer. Please check out their site if you are curious. Now if only there is one there looks good for a regular computer screen. All pen nerds rejoice! Brad Dowdy, master pen addict and Jeffrey Bruckwicki, master sewer have recently joined forces and created a new company - Nock co. They have launched a fantastic Kickstarter to raise money for their new business. 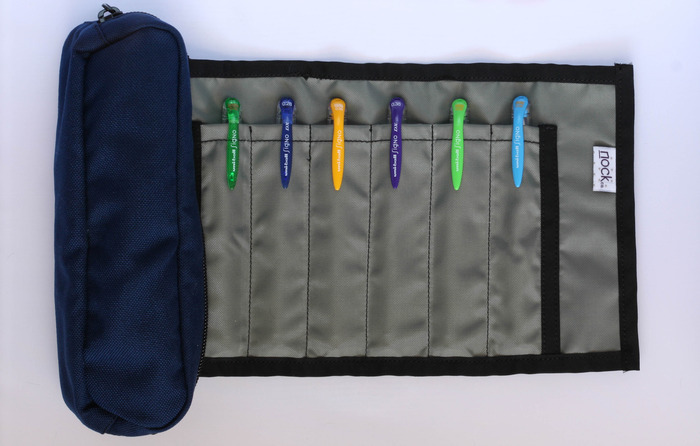 Nock Co. has introduced 6 varying models of pen cases. The Chimneytop is the standard zip pouch type pen case that most Singaporean adults are using. The is the one that I would go for because I can use it for a wide variety of travel purposes. The Lookout is a 3 pen holster style pen case. I am really looking forward to get my grubby hands on it. I have been hunting high and low for a suitablely affordable pen holster for my everyday carrying needs. The Hightower is a 3 pen + 1 notebook case. 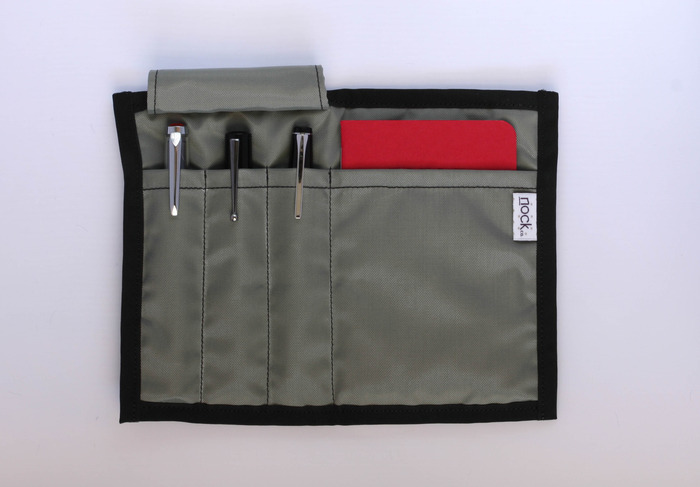 It allows you to keep your notebook and pens all in one case. I think this would be one of the most popular choices it is the best of both worlds. The Sassafras is a 5 pens bi-fold case. For anyone who couldn't decide which 3 pens they want to bring along, they can check out the Sassafras (no idea how this is pronounced). The Brasstown is a zippered roll case. A good combination if you want the ease of use of a zip case and the protection of individual holder for each individual pen. The Brasstown seems to be an intriguing option for one when I posted the link to the Kickstarter page on the Singapore Fountain Pen Lovers group's Facebook page. Personally, I have backed the USD$50 tier where I would get the Chimneytop small, Chimneytop medium, The Lookout, The Sassafras and The Brasstown. I am still on the fence I want to switch to the USD$75 tier. I really want to give the Hightower a try. Hopefully I can get it seperately once the campaign has ended. I highly recommend anyone who is interested to click through and check out the pen cases. Back the Kickstarter to get a good deal on these well designed pen cases. Regardless, congratulations to Nock Co. but a successful launch of their Kickstarter campaign. The Maryapple - Field Notes not included. I have just recently backed a new Kickstarter project called Simple. It is yet another minimalist wallet design but this time in leather. I am sure there are plenty of similarly designed wallets on Kickstarter. I wasn't on the market for a new wallet. I am stilling waiting for the arrival of my previously backed wallet - the Band-It I was browsing around on Kickstarter when Simple caught my eye. It really is as simple as it is named. Basically it comprises of a leather card holder with a O-ring attached to one end and an elastic band that warps around on one side of wallet. The O-ring is to allow you to attach your keys to it while the elastic band is to slide your iPhone into. That way wherever you go your wallet, keys and phone are a single entity. You are less likely to forget about it. I love the colours and designs that they offer. And I have trouble deciding which should I get. Regardless, it is a well designed wallet. I especially like that I can choose to have my name embossed on the wallet. The project has already exceeded its goal and there are 38 more days to go. Anyone who is interested just go ahead and click on the link and check it out. I'll will be writing a review on it once I have it in my hands.